Before you discard all animal-based foods, learn how to approach this style of eating in a healthy way. Although most older Americans still enjoy their steaks and chicken, an estimated 2.5 million of those ages 55 and older have abandoned red meat and poultry in favor of a predominantly plant-based diet. Some people decide to go vegetarian or vegan because they can't bear the thought of harming any living creature. Others do it for the health perks, of which there seem to be many. "There's certainly some research on the benefits of the vegetarian diet," says Kathy McManus, director of the Department of Nutrition at Harvard-affiliated Brigham and Women's Hospital. She ticks off the various advantages associated with this way of eating—lower body mass index and blood pressure; reduced risks for heart disease, diabetes, and cancer; and longer life. Semi-vegetarian.You still eat animal products, but more selectively. Many semi-vegetarians eat chicken and fish but not red meat. Pescatarian. You avoid meat and poultry but still eat fish and seafood. Lacto-ovo vegetarian. You skip all meat, fish, and poultry but include dairy and eggs in your diet. Vegan. This solely plant-based diet is the strictest form of vegetarianism. You eat no animal products at all—not even eggs or dairy products. 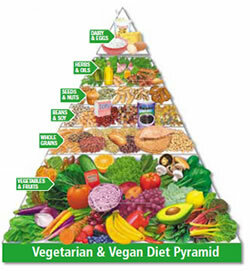 Vegetarian and vegan diets can be healthy, but they can lack certain nutrients. You may have to use a little creativity to ensure you get enough protein, calcium, iron, and vitamin B12. You can find many of these nutrients in eggs and dairy if you're vegetarian, and from plant sources if you're vegan. But you may need an added boost. "Because vitamin B12 is found only in animal sources, if you're a vegan you might consider taking a supplement," McManus says. Omega-3 fatty acids are found in both fish and flaxseeds, but your body doesn't absorb the plant-based form as readily as the omega-3s from seafood. Plant-based supplements are available if your diet needs more of these heart-healthy fats. Keep in mind that going vegetarian doesn't give you carte blanche to eat whatever you want—especially if you're trying to control your weight. Go heavy on fruits, vegetables, and whole grains but limit foods high in saturated fat, such as ice cream, whole milk, and cheese. And watch how much you eat at each meal. "People who are trying to lose weight can certainly do it on a vegetarian diet, but they have to limit portions," McManus says. When you eat out in restaurants, ask the chef to substitute beans for the meat in an entrée. You can also stick with the salad bar or order a few vegetable-based appetizers and sides instead of an entrée. McManus, who is vegetarian, uses this technique herself. She also visits ethnic restaurants. Indian, Thai, and Chinese cuisines all feature an abundance of vegetarian options. The transition to a greener diet doesn't have to be difficult. McManus recommends starting by increasing the number of vegetables on your plate at each meal. "Fill half the plate with vegetables—cooked, raw, or in a salad," she suggests. Then incorporate an all-vegetarian meal once or twice a week. If you like it, keep adding vegetarian—or vegan—meals until you're fully immersed in the diet. To keep your food choices diverse without fish, poultry, and red meat, play around with different vegetables and grains, and spice up your meals with seasonings. "I think sometimes people say, 'Vegetables are so boring,'" McManus says. "Well, they don't need to be. There are so many cuisines with great spices to choose from."